Three’s philosophy is to utilize plant based ingredients and essential oils. Three covers the three major categories: skincare, beauty, and hair care. Three Skincare is popular for cleansing products. Since essential oils are part of Three’s skincare range, they are scented with herbal and woodsy notes. Three is free from artificial fragrances, coloring, parabens and also utilizes certified organic ingredients as much as possible. The line is very clean, pleasant to use, and has a very nice calming effect on skin. I will say, however, if you are not a fan of scented products, then you should stay away from Three since the scent is very noticeable. I found the fact that Three covers skin, beauty, and hair to be rather interesting, as most prestige brands sold in Asia doesn’t cover hair care. Luxury hair care is still a relatively new concept in Asia, with foreign brands such as Kiehl’s and Kerastase being the major players. Three’s hair care line utilizes the same principle as the skincare line, with the same scent and clean rinse. I did not get a chance to try the color products – this will have to be on my list on the next trip. By now, you probably already know that women in Asia take cleansing very seriously. As cleansing is the first basic step that prepares the skin to receive treatment, Three’s emphasis is evident with four main products in its Cleansing line-up: a Balancing Makeup Removing Oil, the Point Makeup Remover, a Cleanser, and Scrub. 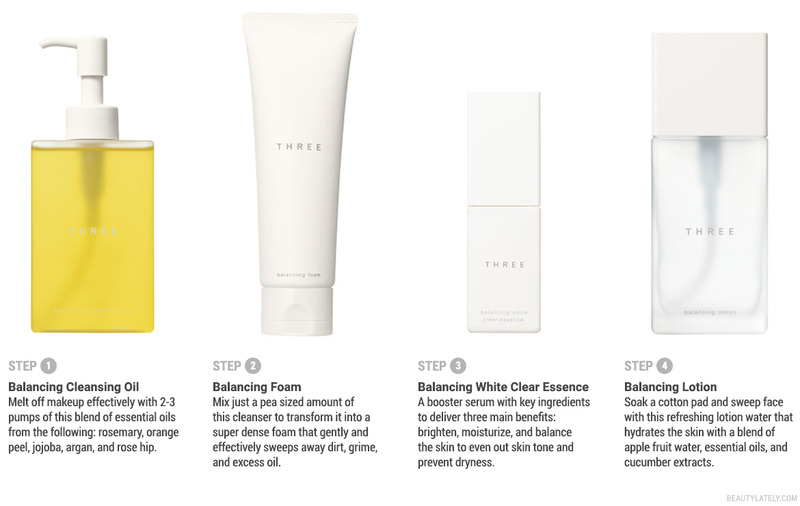 The great thing about Three’s Cleansing line is the efficacy. The first thing you notice about the Balancing Foam is the density of the lather. You really only need a very tiny amount of product for it to produce a very rich, dense foam and cleans extremely well without stripping the skin. For a demo of the Point Makeup Remover, check out the video to the side. For those of you wanting to check out Three and don’t know where to begin, here is a typical routine using their popular products. It’s worth mentioning here that the Essence comes before the Balancing Lotion, which I thought was interesting, as I was always taught to apply skincare in the order of viscosity – from most liquid to thicker creams. Following a serum with liquid toner was a first for me, but did not take away from the effectiveness of the overall line. I finished the routine below with my usual Avene Rich Compensating Creme. Overall, a solid skincare line that appeals to the consumer who wants plant based, natural organic ingredients in your skincare without additives like parabens and artificial fragrances. My usually sensitive skin didn’t react to any of the formulas and the performance of the products is quite impressive.